When asked if an engagement is on the horizon for this couple, Angela admitted to E! News, "I'm patiently waiting." Tyler then quickly added, "We're very happy right now." 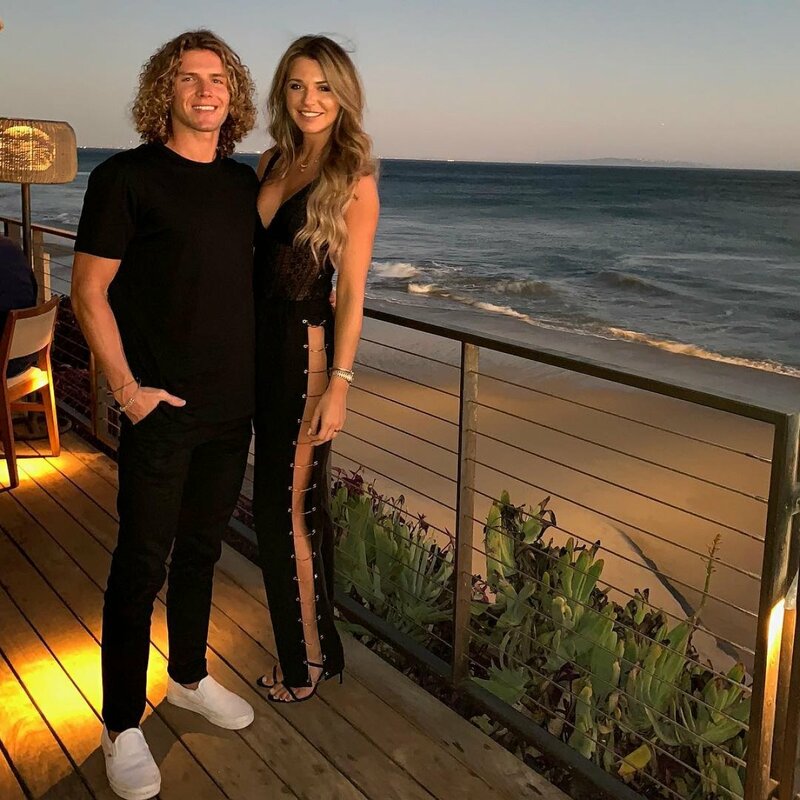 Tyler and Angela fell in love on Big Brother's 20th season this past summer, and shortly after the finale aired, the pair moved in together in Los Angeles, CA. "After the Big Brother house, it only seemed natural," Angela said of the decision to share her place with Tyler, a South Carolina lifeguard. "We were so used to living together and sharing a bed together throughout most of the season so going back into my normal life, it felt natural for him to move in with me. I couldn't imagine living without him." Tyler told E! News of the major life change, "It's been great... The move has been so smooth. It feels so natural. I love it." The couple revealed that instead of enjoying nightlife and going out with their friends, they spend a lot of time alone at their house, ordering food and watching Big Brother reruns of their season. "We're almost finished so that's kind of been our date night is ordering take out in and watching an episode or two," Angela shared. "It's kind of embarrassing and weird and awkward, but we love it." Tyler and Angela are also mingling with people in the Big Brother family, as they were recently invited to Jessica Graf and Cody Nickson's gender reveal party. Tyler and Angela admitted the Season 19 Big Brother couple are "definitely role models" for them. And, like Jessica and Cody, Angela and Tyler would be up for starring on more reality TV shows, as long as they're in it together. "We're totally open to doing more shows and I think The Amazing Race would be the most amazing experience," Angela shared. "I think Survivor would be really cool too. At the end of the day, I'm not going to do anything that Tyler doesn't do with me and I can't imagine being on another season of Big Brother in the house without him there. We're kinda a package deal." Tyler and Angela's relationship in the Big Brother house started out as just a friendship and was a slow burn. The more Tyler and Angela got to know each other, feelings developed and sparks began to fly. The couple, however, kissed behind closed doors and attempted to keep their showmance a secret as to avoid becoming targets. The couple didn't announce to their fellow houseguests they're an item until the live finale. Tyler walked away from Big Brother with a total of $75,000 for finishing as the runner-up and also being named "America's Favorite Houseguest." Angela placed fourth because her two allies, Tyler and Kaycee Clark, had made a Final 2 deal with each other. Two other relationships also blossomed from Season 20 of Big Brother -- dating couple Haleigh Broucher and Faysal Shafaat as well as engaged couple Chris "Swaggy C" Williams and Bayleigh Dayton.